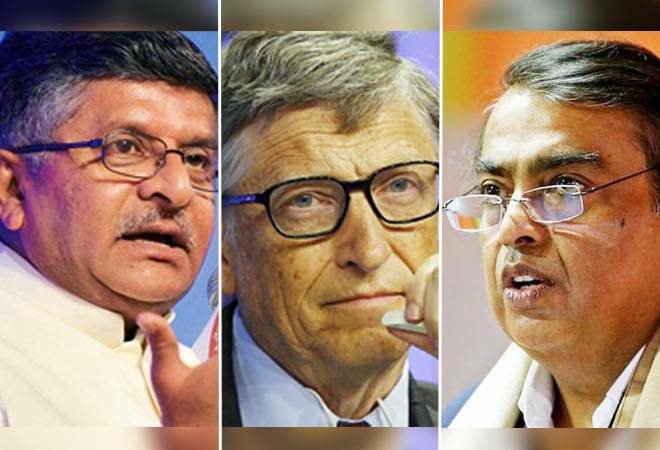 Union Minister Ravi Shankar Prasad, India's richest man Mukesh Ambani and Microsoft founder Bill Gates are among the e-residency holders of Estonia. Union Minister Ravi Shankar Prasad, India's richest man Mukesh Ambani and Microsoft founder Bill Gates are among the e-residency holders of Estonia, its Ambassador to India Riho Kruuv said here on Thursday. "Very prominent people are also Estonian e-residents. Present Minister of IT and Law and Justice honourable Ravi Shankar Prasad is an Estonian e-resident. Business tycoon Mukesh Ambani is an e-resident. Pope Francis and Bill Gates also (e-residents). This status has been given to world leaders and they have accepted it," he told reporters here.